Solution: Four possible electron configurations for a nitrogen atom are shown below, but only one schematic represents the correct configuration for a nitrogen atom in its ground state. Which one is the correct electron configuration? Which configurations violate the Pauli exclusion principle? Four possible electron configurations for a nitrogen atom are shown below, but only one schematic represents the correct configuration for a nitrogen atom in its ground state. Which one is the correct electron configuration? 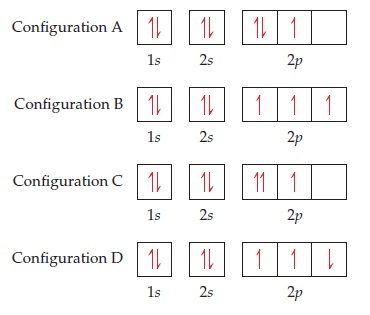 Which configurations violate the Pauli exclusion principle?